North Dakota’s homesteading spirit is evident at Icelandic State Park, located on the shores of Lake Renwick. Established in 1964; this 912-acre park allows visitors to learn about the state’s early settlement and provides an array of recreational opportunities. Boating, swimming, and fishing are a few favorite summer activities while snowshoeing and cross-country skiing are popular during the winter. Picnic areas enable visitors to enjoy a relaxing afternoon in the shade of old oak trees. Within the park, visitors will find a number of restored historic buildings including Akra Community Hall and Hallson Church. Visitors can walk through the Pioneer Heritage Center that houses exhibits and hosts programing that highlights North Dakota’s homesteading years. Visitors can also spend time exploring the 3 mile trail system in North Dakota’s first dedicated state nature preserve, Gunlogson Nature Preserve. The 200-acre natural wooded area along the Tongue River is a sanctuary for plants, birds, and wildlife. More than a dozen rare species exist in the preserve, ranging from Watermeal to Bishop’s Cap. The preserve also contains rare birds such as the Pileated Woodpecker and Western Wood-Pewee. Icelandic State Park is home to three seasonal camping cabins. The Pine cabin is located in the North Loop Campground, the Aspen is located in the South Loop Campground and the Oak Cabin is located in the West Loop Campground. These camping cabins each sleep 5, bunkbed-style. Each cabin is equipped with lights, heat, air conditioning, and a deck. Cooking is not allowed inside, but a grill and picnic table are located outside of each cabin. 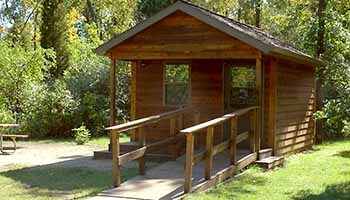 The cabins do not have showers, sinks or toilets, but most are within a short walk to a campground comfort station. Camping cabins are generally available from May 19th to September 30th. Akra Hall can seat up to 150. It includes a catering kitchen with refrigerator, sink, piano, tables (4) 6' tables and (12) 8' tables and service counter. Akra Hall is available from May 15 - September 30 and requires a 2-day rental minimum on weekends. The hall can be booked by calling the park at (701) 265-4561. Pioneer Heritage Center Meeting Room seats up to 75 people. Audio/video equipment includes four microphones, LCD projector with 4x8-ft built-in screen. It is available year round and can be booked by calling the park at (701) 265-4561. The Hallson Church can seat up to 100 people. The church has pews for seating and has two organs (one electric, one pump) available for use. Hallson Church is available from May 15 - September 30 and requires a 2-day rental minimum on weekends. The church can be booked by calling the park at (701) 265-4561. The park has one medium shelter (electricity) holds up to 12 tables and 96 people. The picnic shelter has four charcoal grills available for use and outdoor toilets are located nearby. The picnic shelter can be booked by calling the park at (701) 265-4561. 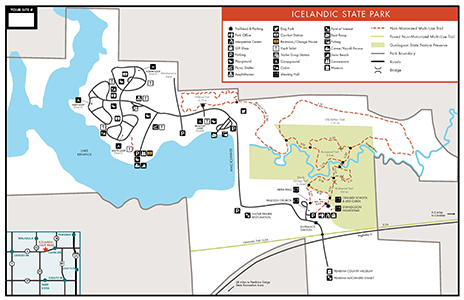 Icelandic has over 4 miles of trails that wind through the park and the historic 200-acre Gunlogson Nature Preserve. The majority of this 4-mile trail system is groomed and open in the winter for cross-country skiing. The Hillman Trailhead is located across from the Primitive Campground. This .75-mile trail loops through a grove of evergreen trees and connects to the Bluebird trail. It is open to hiking, mountain biking and snowshoeing. The Bluebird Trail connects to the Hillman Trail and takes you down along the banks of the Tongue River, to the Gunlogson Nature Preserve. Bluebird boxes line the trail and provided shelter for nesting Eastern Bluebirds and Tree Swallows. Keep your eye out for River Otter catching fish along the spillway and Great Blue Heron on the riverbank. This trail is open to hiking, and mountain biking. It is groomed in the winter for cross-country skiing. The Old Settlers Trail loops through the woodlands of the Gunlogson Nature Preserve and connects to the Bluebird and Basswood Trails. It is open to hiking and is groomed for cross-country skiing in the winter. The Basswood Trail is accessed through the Old Settlers and Wildwood Trails. The trail leads you through the native woodlands on the banks of the Tongue River. A bridge that crosses the Tongue River connects the Basswood and Wildwood Trails. If you are lucky, you may spot a River Otter or Beaver in the water below. This trail is open to hiking and is groomed for cross-country skiing in the winter. The Wildwood Trailhead is located near the Gunlogson barn. It connects to the Shady Springs Trail and leads you to the bridge that crosses the Tongue River, connecting to the Basswood Trail. This interpretive trail guides you through the Gunlogson Nature Preserve; North Dakota’s first designated nature preserve. 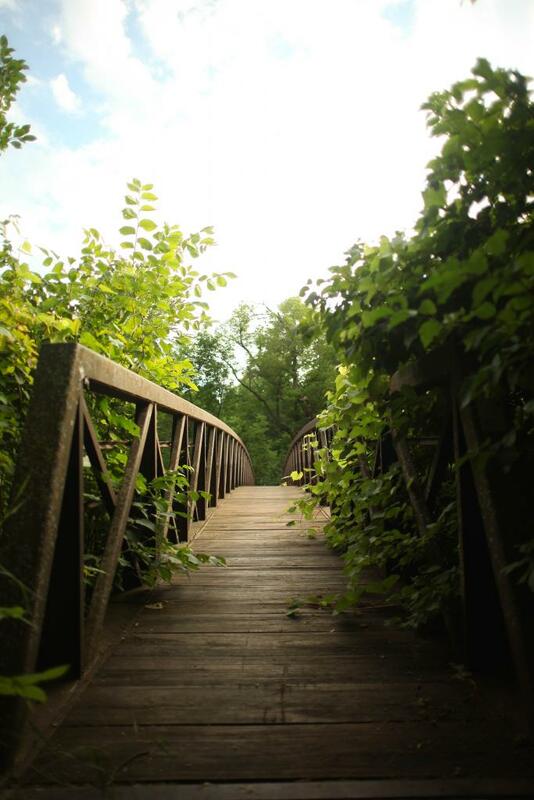 Footbridges take you over the streams and springs scattered throughout the preserve. Along the trail, you will find many native plants including scouring rush and several species of ferns. Interpretive brochures are located at the trailhead or at the Pioneer Heritage Center. The Shady Springs Trail can be accessed on the north side of the Gunlogson Barn or the Akra Hall and connects to the Wildwood Trail. This trail includes footbridges that take you over the natural springs and wetlands. Many native plants and wildflowers can be seen along the trail including the Marsh Marigold. This trail is open to hiking. The Cavlandic trail runs from the city of Cavalier to Icelandic State Park. The trail is 6.5 miles one way and provides users access to a number of amenities in the city of Cavalier.